Supermarket chain Iceland has been criticised by campaigners after deciding to ban palm oil from its own products by the end of 2018. The Deeside-based is the first major UK supermarket to ban it, claiming rising demand is devastating tropical rainforests across south east Asia. Human Faces of Palm Oil disputes this, saying it produces wealth for families and requires less land than other oils. Palm oil is used in half of Iceland's products, from biscuits to soap. Managing director Richard Walker said at the time: "Certified sustainable palm oil does not currently limit deforestation and it does not currently limit the growth of palm oil plantations. "So until such a time as there is genuinely sustainable palm oil that contains zero deforestation, we are saying no to palm oil." However, palm oil producers disagree in a social media campaign by Human Faces of Palm Oil which represents, among others, the Malaysian Palm Oil Council, and says it "seeks to advocate on behalf of Malaysian small farmers". 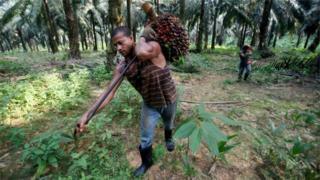 It says more than 650,000 small farmers in Malaysia cultivate palm oil. And it also claims the industry requires less land for cultivation than replacement oils. How do you make palm oil-free mince pies? Iceland declined to comment, but in a blog post, Mr Walker said "we're not against palm oil. What we are against is deforestation". He added: "There has certainly been no shortage of debate since we made our announcement, and I am pleased by the worldwide attention we have achieved."